home insights scaling up? 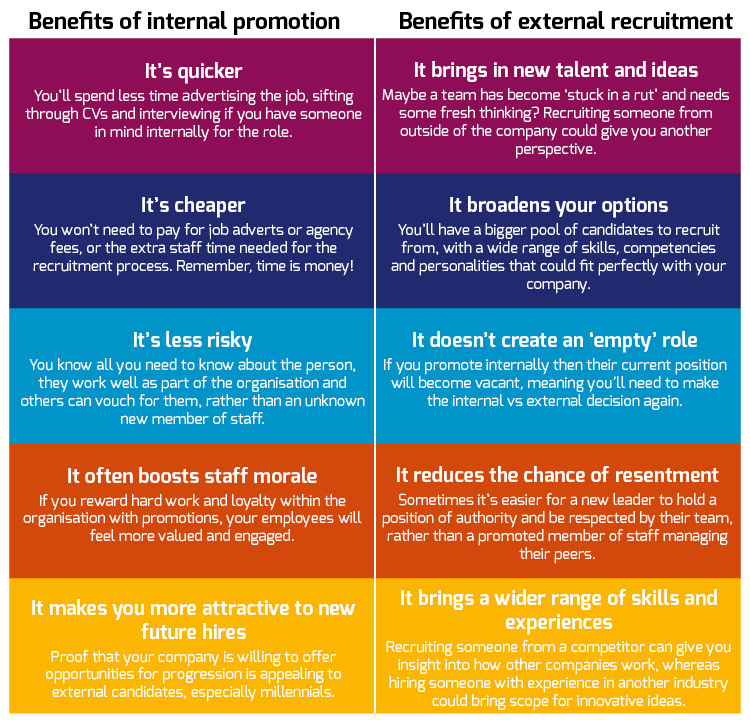 should you promote, or recruit? Scaling up? Should you promote, or recruit? Should you promote your existing staff or hire new people while you’re scaling up? We take a look at the pros and cons of each avenue. It’s clear that there are pros and cons for each option, so you should always hire the best person for the job, regardless of whether that’s by promoting a member of staff or hiring a new one. Internal recruitment works well if you have great talent in your organisation now, and if you have the perfect person in mind for the role. However, if you have any doubts about whether someone is right for the role, don’t promote them just because it’s cheaper, easier and quicker as you scale-up. Ask yourself if you need the experience of a seasoned expert or a particular skillset in this role that you don’t currently have within the company. If the answer is yes, then you should look at external recruitment. Make sure you consider all avenues and avoid any snap decisions – it’ll make a big difference in the long term! “We ideally like to try and promote from within and do this through clear progression planning alongside our bi-annual appraisal process. We find internal promotions encourage, incentivise and motivate staff and have seen many successful promotions within Perfect Image. "At Haines Watts, we like to recruit using a combination of internal and external methods, and we believe both have their own merits. “Where possible, we promote from within – we find that providing our employees with the opportunity to progress and grow their career helps with morale and staff retention. In addition to the benefit to team culture, we find our clients appreciate the continuity of working with the same team members too." "For us, external recruitment is all about injecting new ideas and ways of working into the business. We often find those who are recruited from elsewhere bring a wealth of knowledge and fresh perspective which improves workflow." "We're big believers in growing our own talent here at r//evolution. It's very much part of our culture, to constantly improve ourselves, developing new skills and 'being better every day'. We've had success with this - spotting talented graduates and more recently apprenticeships & nurturing them in-house. “That said, sometimes new blood is a real benefit, and of course we have brought in talent, from the North East and further afield. This can be a great way to ensure different perspectives and ways of working - which is always valuable - and can be a quicker solution than growing our own."